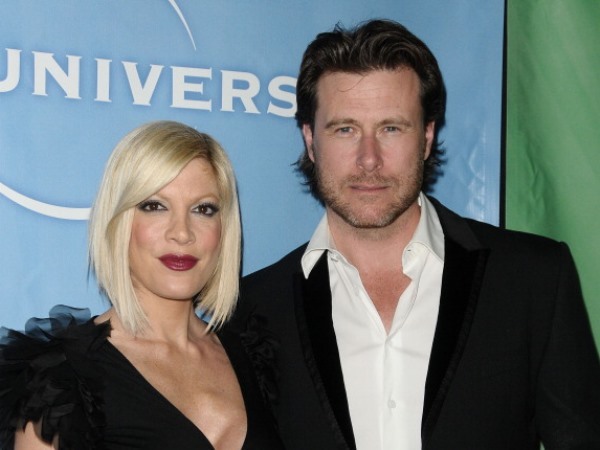 Tori Spelling and Dean McDermott are putting their troubled year behind them with an attempt at a cute family Christmas card. The pair’s marriage hit the rocks earlier this year when it was revealed Dean had been unfaithful to his wife, with whom he has four children. However, the couple united for their holiday card, which Tori posted on her Twitter page. Alongside the shot, which shows her and Dean sitting together surrounded by their children Liam, Stella, Hattie and Finn, Tori wrote: “LOVE our holiday card! This year I used http://www.SimplytoImpress.com – Super cute designs + very affordable!” Tori’s revelation of the card comes after Dean opened up about the state of their marriage in a heartfelt interview on NBC programme Today. Insisting the pair have moved past their troubles, Dean added that the issues have actually made their marriage “stronger” than ever. "We are in a better place than ever,” Dean said. “Our love is stronger. We're solid. We're communicating. We're actually having a fully functional relationship." Appearing on the same show two days previously, Tori had confessed she finds her reality show True Tori something of a “therapy” session. But while Dean has revealed he isn’t keen to continue taking part in the show, he said that he would happily support his wife if she’d like to do another series of the reality programme. "If it helps her, absolutely," he said. "I support her 100%." Dean added that while the show hasn’t been as cathartic for him, he can understand what Tori means when she describes it as therapeutic. “I've learned a lot about myself, our relationship—it's been a good process," he said. "But as it goes and continues, it's taking a toll on me. It's not good for me. It's different for everybody. If it works for T, that's great, but I'm finding I'm having a hard time with it." I'm a 74 year old man looking to meet women between the ages of 66 and 72. I'm a 27 year old woman looking to meet men between the ages of 32 and 58.